If you’ve never been to the Phoenix College Holiday Art Sale – it’s time you go. Next week students and faculty will participate in the annual event. You’ll find art that ranges from the traditional to the unusual, all of it hand-crafted. The sale includes ceramics, sculpture, jewelry, glass, paintings, prints, photographs, and more – the fine and the creative. Phoenix College is located on Thomas and 15th Ave. You will find the art department on the North end of the campus, next to easy parking. The Erich Ficshl gallery is on the second floor of the art building. The sale is open to the public. All sales are cash only. 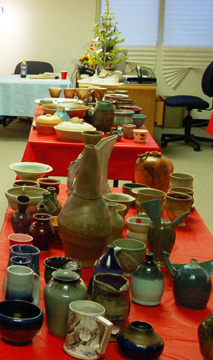 A percentage of the profits go to support Fine Arts programs at the college. Click → Map. Contact the Phoenix College Art Department for more info. I’ll have my coasters in the sale as well.